Each year for our anniversary, Dustin and I try to plan some sort of trip to celebrate another year of wedded bliss....Last year we went out west, on what we now consider the trip of a lifetime. (If you want to live vicariously...you can check that out in the archives) So we've set the bar pretty high for memory making, and there was a bit of pressure to make this year...our fifth year even more special. We kicked around pretty much every idea possible- Puerto Rico? California? Fiji? Montana? But we just couldn't find the perfect trip that fit our desires, our timeline and of course, our (small) budget. Truth be told, as much as I LOVE going on vacation, I hate planning it. Hate researching hotels, and flights, and restaurants and activities. Endlessly comparing one place to another, this plan to that plan, all inclusive vs. a la cart. The options are overwhelming, and the limits are frustrating. (If only you could just hire someone to do this all for you. They could like, an agent....of travel. Could be genius!) Each time we thought we landed on something, we'd hit a roadblock, and have to start from scratch. All this work, all this time, all this effort...just to relax. Oh, the never ending irony of my type-A, perpetually internally conflicted existence. But then....we found it. The one. The place. Our place. 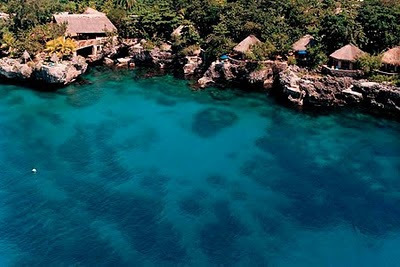 I give you: The Rockhouse Hotel, Negril, Jamaica. I've never in my life even thought about going to Jamaica. It's not that I didn't want to go, it's just wasn't ever really on my list. In some ways it reminds me of meeting the man I now call my husband. I assure you, at nineteen years old, I didn't set out for a month of volunteer service at YL camp because I was looking for a husband. That thought wasn't even on my radar. But then I saw him. And it all changed. For some reason, The Rockhouse kept appearing before me, even when I wasn't looking. I saw pictures in magazines, and on blogs. As I flipped through a copy of GQ on a trip to Columbus, I saw that photo of the bridge, and I off-handedly remarked to Dustin- "There. Take me there." As we continued our search, I couldn't get this place out of my mind. We debated, agonized and number-crunched, but the most simple thought in my heart was "There. Take me there." And so he will. The Rockhouse Hotel, in Negril, Jamaica, sits atop limestone cliffs overlooking the coral reefs of Pristine Cove and the surreally blue waters of the Caribbean Sea. Winding passageways shaped from hand-cut stone bring guests to a 60-foot-long infinity pool located near Jamaica's westernmost point—when there's no cloud cover (and there usually isn't), sunsets are spectacular. 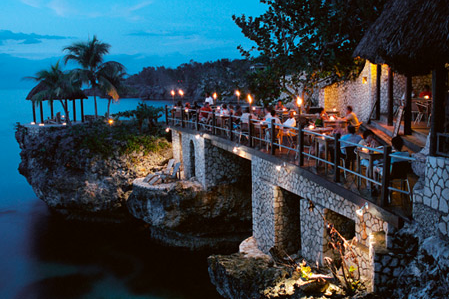 The hotel's two restaurants serve modern interpretations of classic Jamaican cooking at tables on a balcony hanging over the cove. In the new on-site spa, try the Ultimate Coffee Scrub, which blends pinches of orange, cinnamon, nutmeg, vanilla, and brown sugar with beans from Jamaica's own Blue Mountain Coffee for an invigorating rubdown.Upgrade worthy: For the utmost in seclusion, spring for the thatched-roof villas near the edge of the cove, which have wraparound decks, private enclosed outdoor showers, and rock staircases leading to the water below. Negril is known for its beach—a seven-mile stretch of white sand—but the Jamaican coast gets rocky as you go west, and perched over the water, on the western 'cliff side' of the island, is the Rockhouse. I've been going to the Rockhouse for ten years; I brought my wife on her first trip to Jamaica, and she fell in love…The Rockhouse has this great vibe, which I'm a little biased about, because I think Jamaica is about the food, and the music, and the culture, and this incredibly relaxed feeling that sets in while you're there. And the Rockhouse is the perfect place to bring that girl you want to take somewhere, because it has all the trappings—thatched-roof bungalows that feel like French Polynesia, fishermen who bring fresh fish right up to the restaurant, a fantastic bar. It's just paradise, and you'll feel like the two of you are far, far from the rest of the world. The water is pristine, and it's the best sunset you can find in Jamaica—full stop. I'll put it this way: It's my favorite place in the world. alright ... so you jocked us on the coffee table. but I want the full recap of this trip because I SO want it to be awesome so I can whisk Jill away to some place super awesome like that.